Tweenies are children aged between 21-36 months. In the Tweenie Room we still offer a very hands on approach and we engage with the children in their play to help them to stretch their growing imaginations and give lots of cuddles and comfort when needed. Tweenies are given time to explore and familiarise themselves with their surroundings. The gradual introduction of structure along with child led and focused activities help ensure your Tweenie has lots of fun. 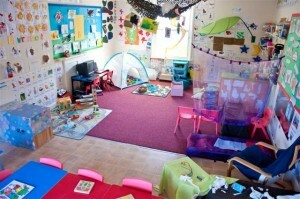 In the Tweenie Room we aim to give the children a little more independence and confidence. We achieve this through allowing the children to access freely all of the toys we have throughout the day and, allowing them to play with them as they wish. As part of our free play time we also have table top activities available which focus on Literacy and Mathematical skills. 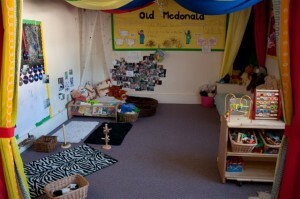 such as mark making, reading, jigsaws and sorting games. We still have structured planned activities that target the 22-36 month and 30-50 month age groups in the EYFS, and we plan these activities based on what we have observed from the children here at nursery and what you tell us they have achieved at home. We still work on the three Prime Areas – Personal, Social and Emotional development, Physical development and Communication and Language. However, we also develop the Specific Areas: Literacy, Mathematics, Understanding the World, and Expressive Arts and Design. 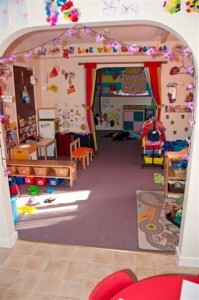 What areas of play do we have in the Tweenie Room? an open access art trolley to promote creativity and expression through media and materials. During our song times in Tweenies, we sing a letters and sounds song which goes through the alphabet and makes each letter sound. This helps them to develop their speech sounds and gets them ready for doing Jolly Phonics in Pre-School. We also have a focus of getting the children to help with tidying up toys they have got out and asking their opinions of what they would like to do in the room.